Armament 15 x 6"/47, 8 x 5"/25, 8 x 0.5" 4 Aircraft. 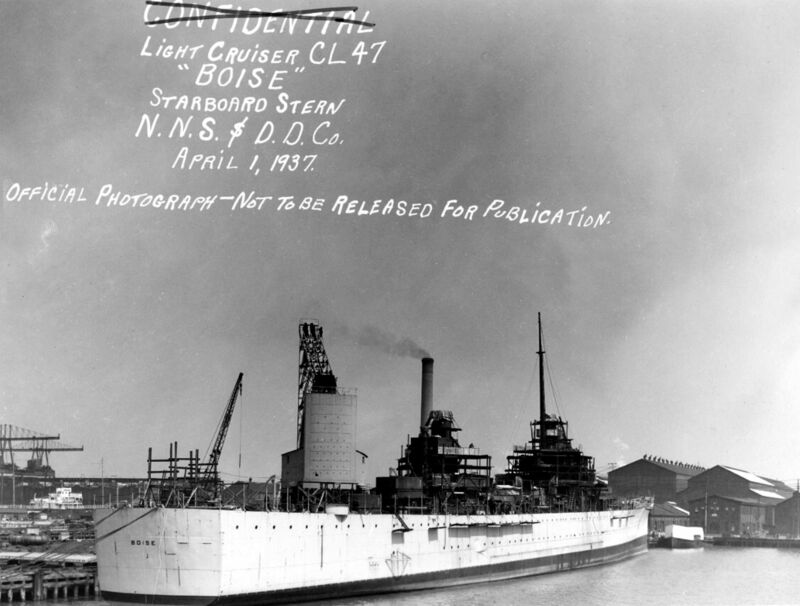 Starboard quarter view of Boise (CL 47) fitting out at Newport News, Virginia, 1 April 1937. Starboard bow view of Boise (CL 47) fitting out at Newport News, Virginia, 1 July 1937. 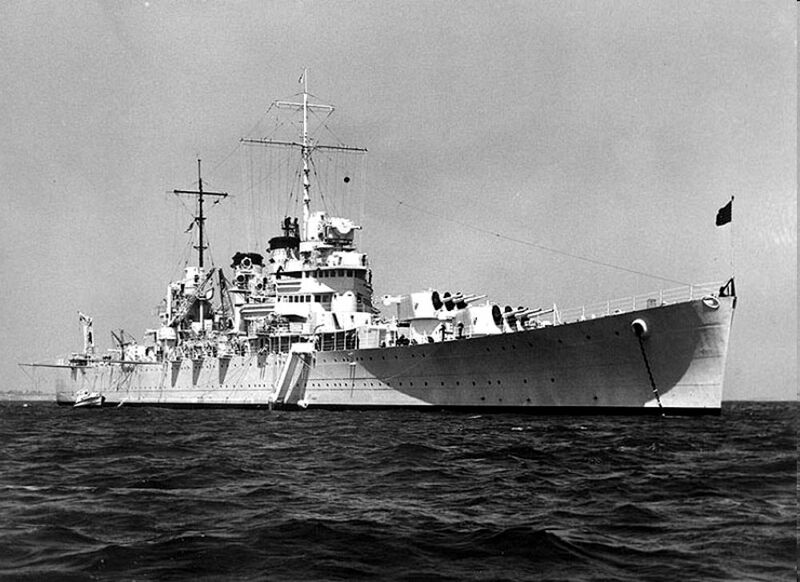 Starboard Bow, Underway, 7 July 1938. 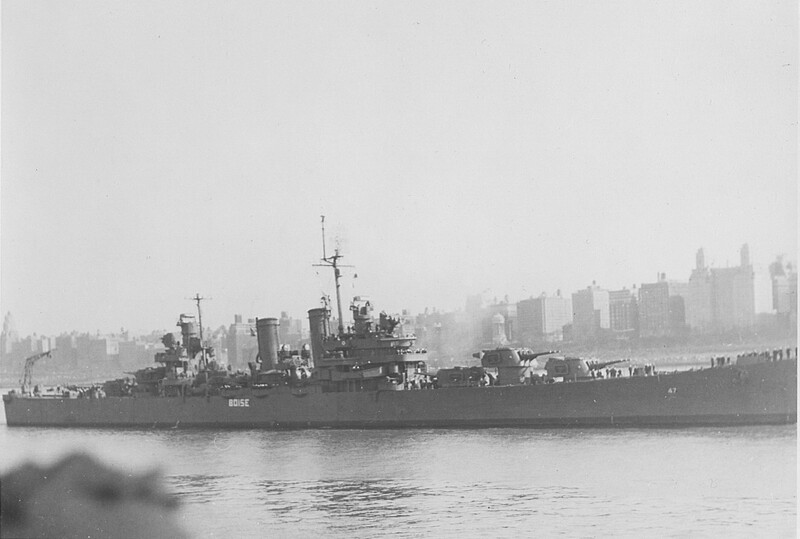 USS Boise (CL 47) anchored in harbor, circa 1938-39. Official U.S. Navy Photograph, from the collections of the Naval Historical Centre. Photo # NH 97779. 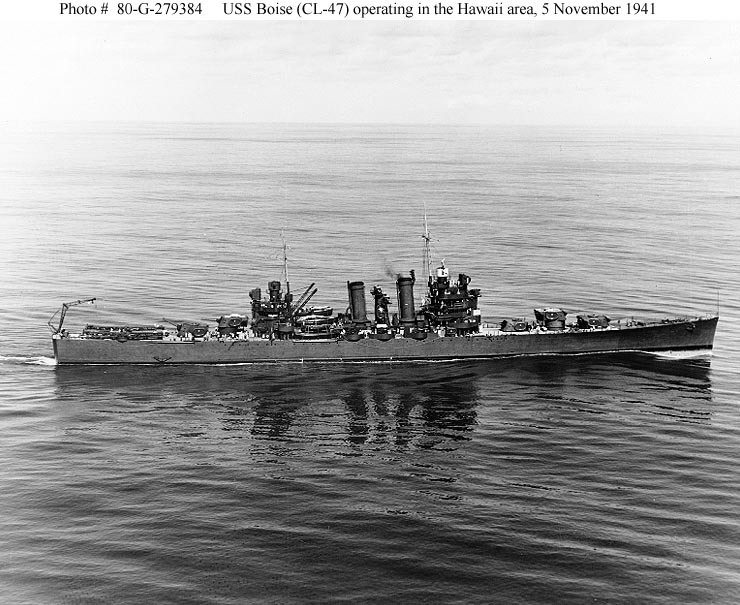 Operating off Hawaii on 5 November 1941. 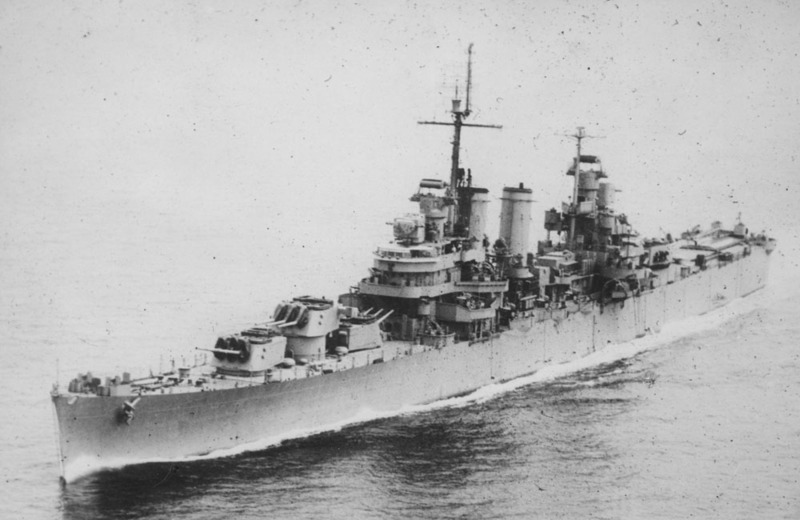 The ship is wearing Measure 1 camouflage paint. 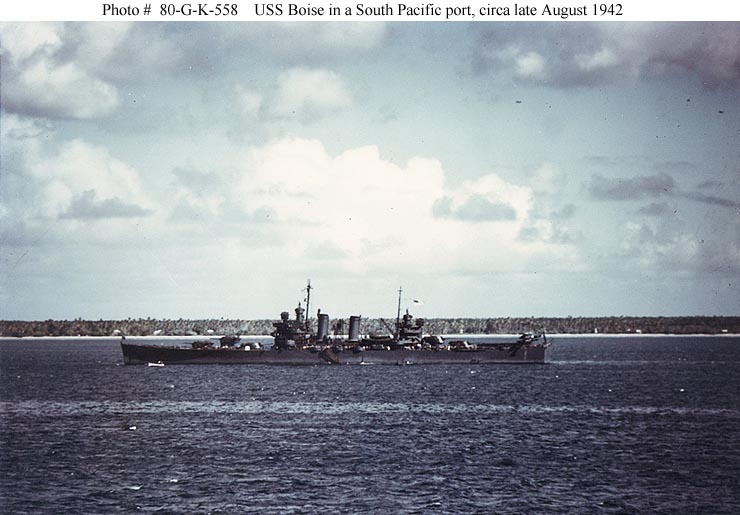 Official U.S. Navy Photograph, now in the collections of the National Archives - 80-G-279384. 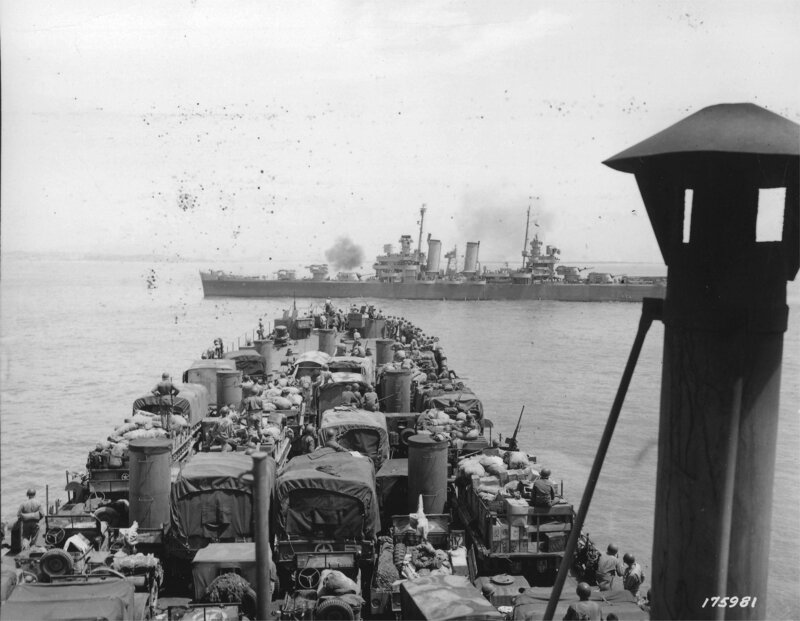 Photographed circa late August 1942, probably at Espiritu Santo, New Hebrides. 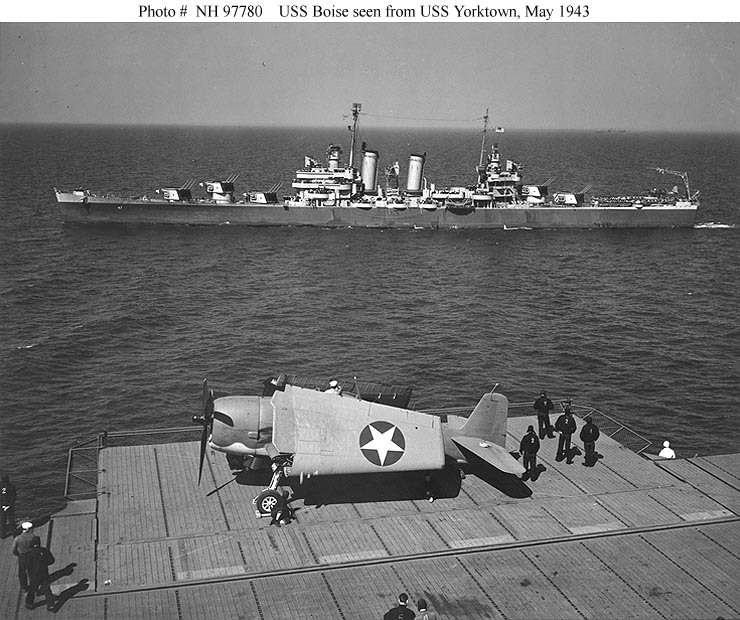 Seen from the island of USS Yorktown (CV 10) on 6 May 1943. A Grumman F6F-3 "Hellcat" fighter is parked on the carrier's deck-edge elevator, in the foreground. 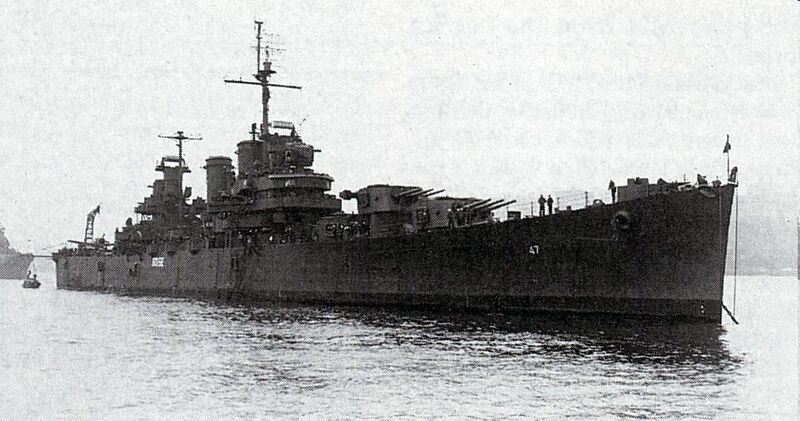 Note Boise's fresh Measure 22 camouflage, and her fifteen 6"/47 guns trained on her port quarter at high elevation. Official U.S. Navy Photograph, from the collections of the Naval Historical Center - NH 97780. Arrives at the Philadelphia Navy Yard, Pennsylvania, for battle damage repairs, November 1942. 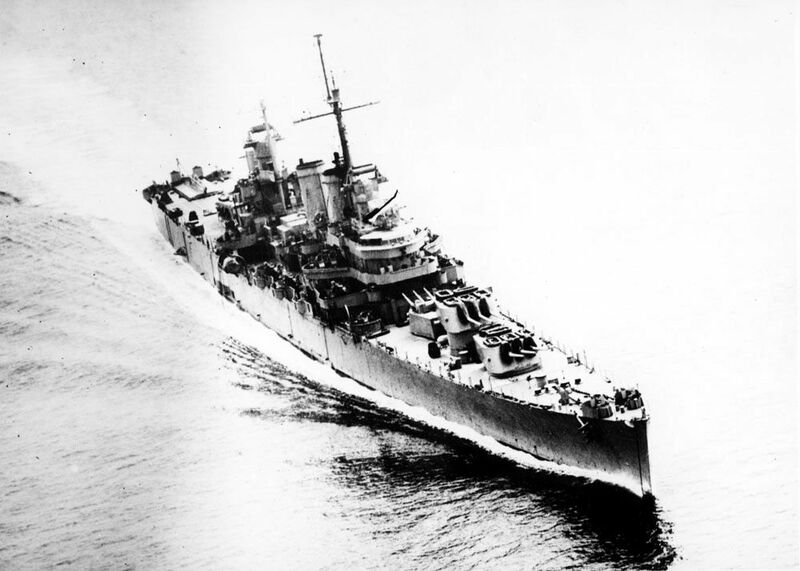 She had been hit by enemy shellfire in the Battle of Cape Esperance on 12 October 1942, resulting in a large fire that burned out her three forward 6"/47 gun turrets and their ammunition spaces. Official U.S. Navy Photograph, now in the collections of the National Archives #80-G-40069. 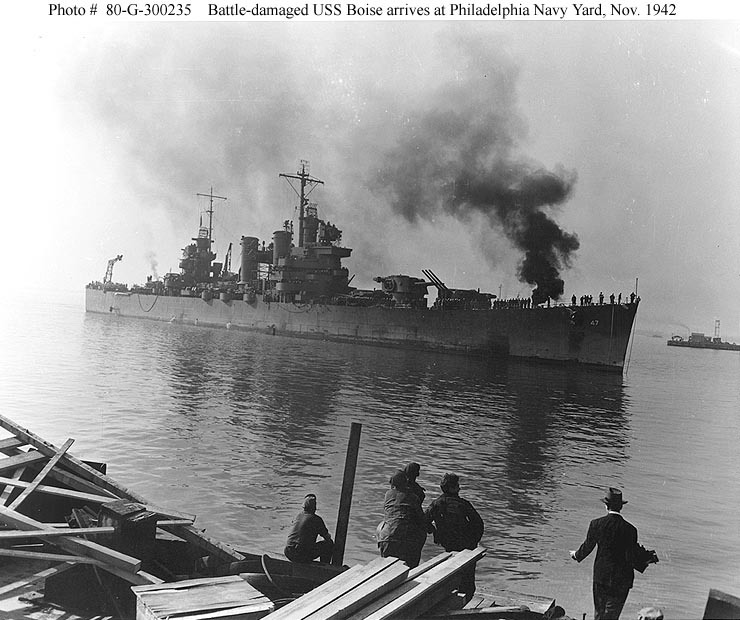 USS Boise (CL 47) arrives at the Philadelphia Navy Yard in November 1942 for repair of battle damage received during the 11-12 October Battle of Cape Esperance. 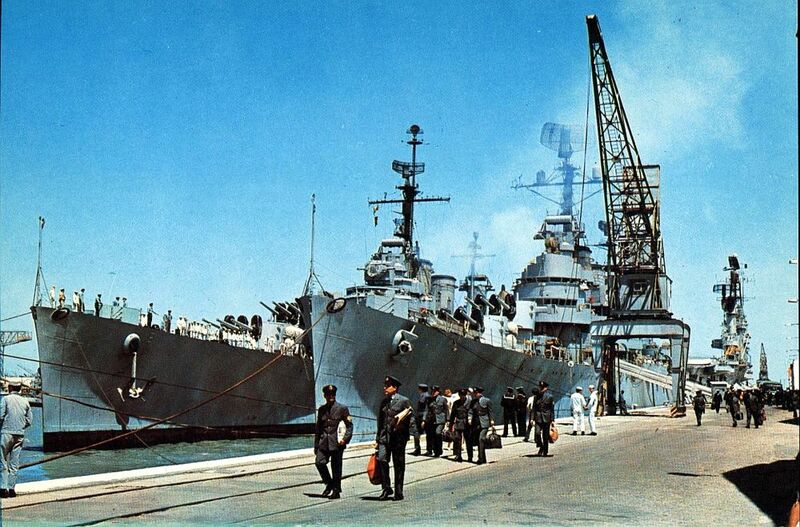 Note the forward 6"/47 triple gun turret trained to starboard. It was jammed in this position during the action, when a Japanese 8" shell hit the armored barbette just below the turret. 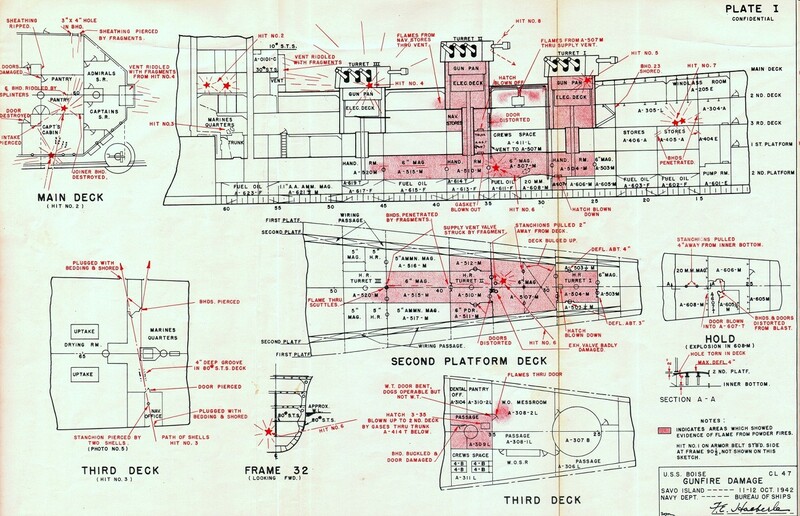 USS Boise (CL 47) gunfire damage diagram from 11-12 October 1942 off Savo Island. 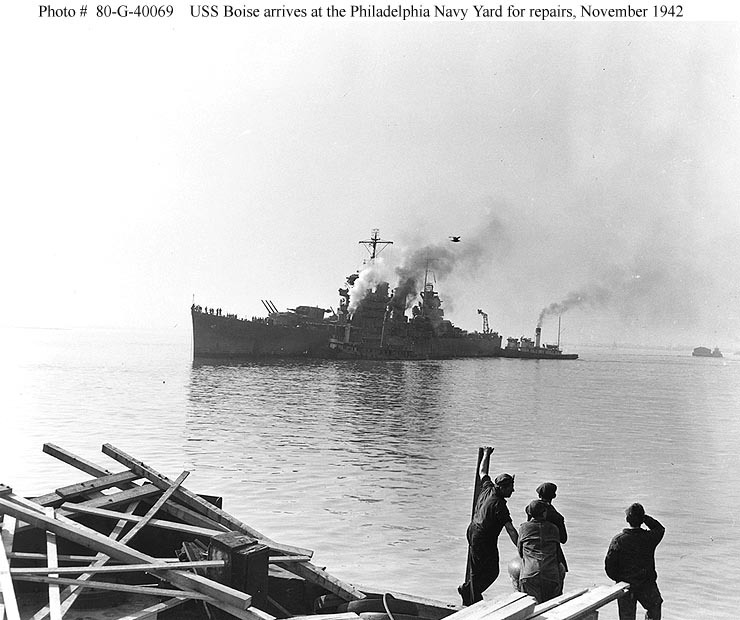 Looking forward the view of the starboard side hull of the USS Boise (CL 47) at the Philadelphia Navy Yard on 25 November 1942. 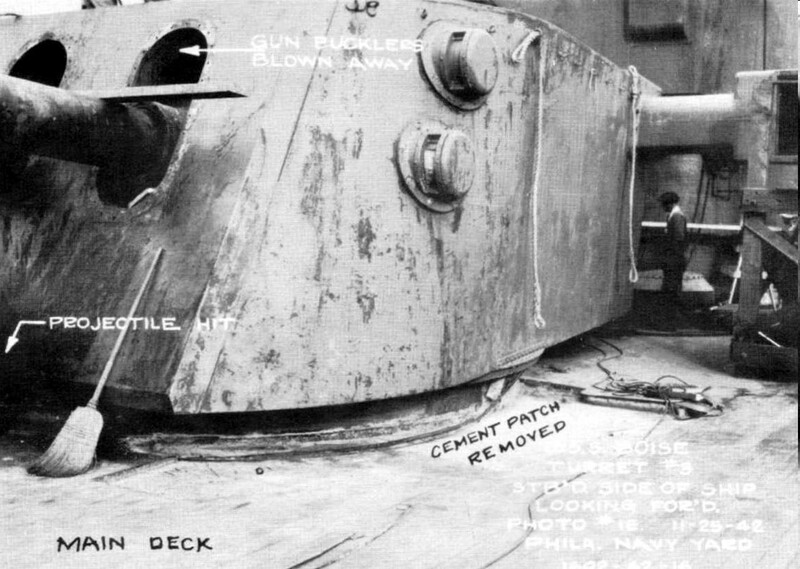 Visible is the dent in the armor and patch over shell hole No. 1, located at Frame 90 1/2. Face plate Turret No. 3 damage from hit No. 3. 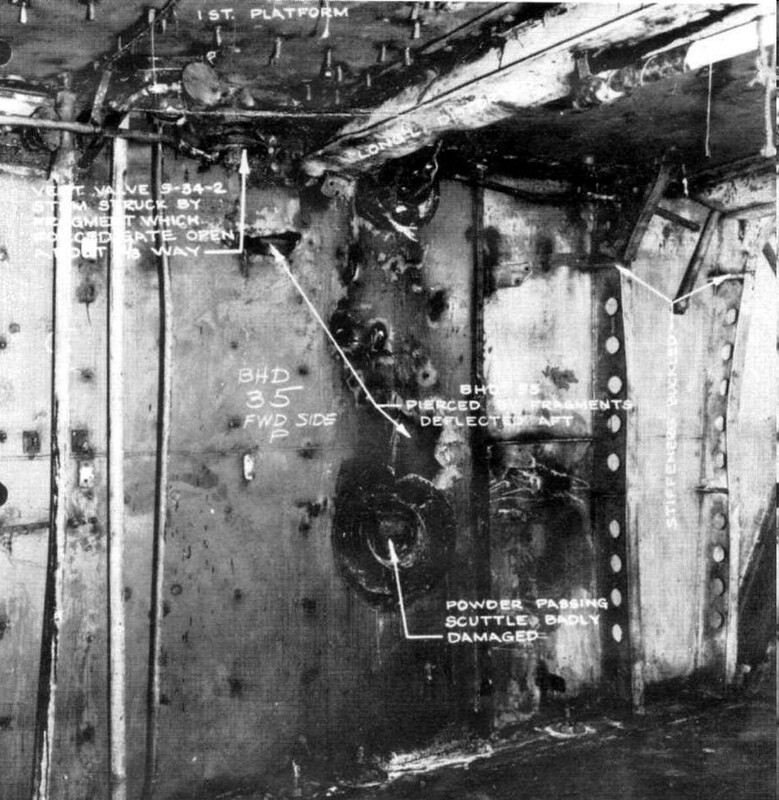 View of starboard side looking forward showing the damage done to the main deck of the USS Boise (CL 47). 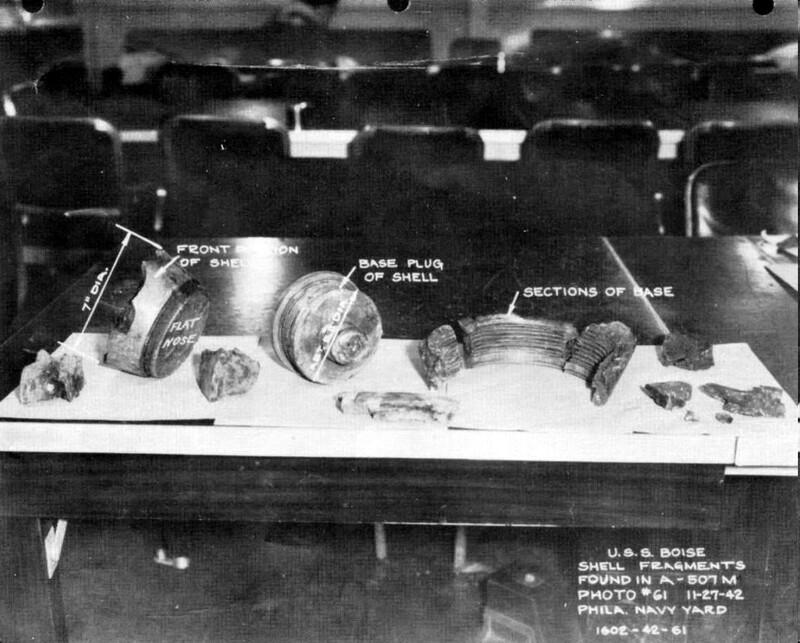 View of portions of the base of 8-inch projectile from hit No. 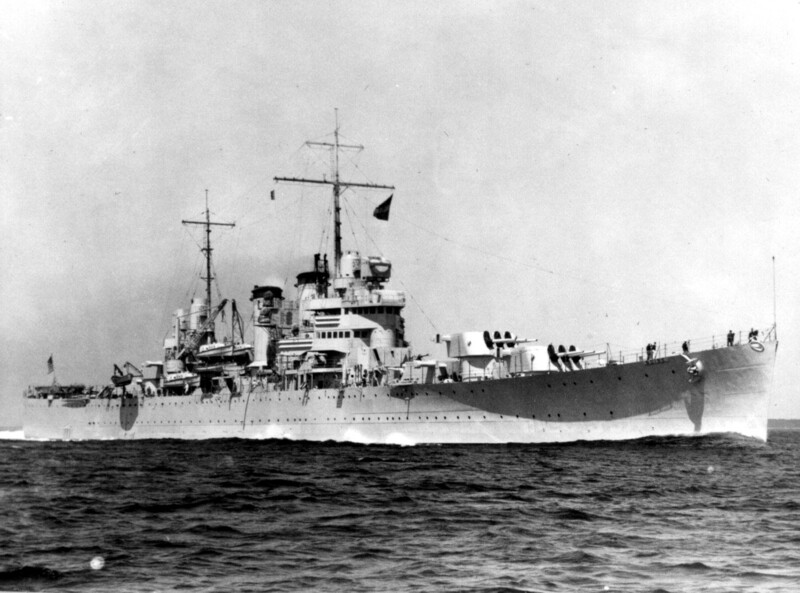 5, as seen on 27 November 1942. 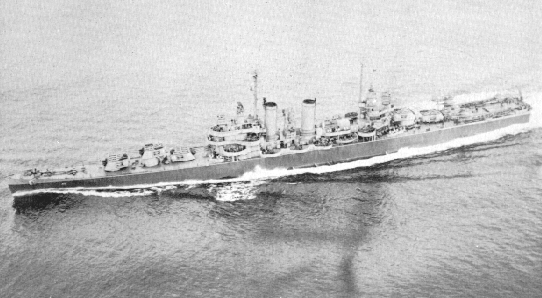 After removal from the USS Boise (CL 47) examination of the base markings and design features show that it is of English manufacture. 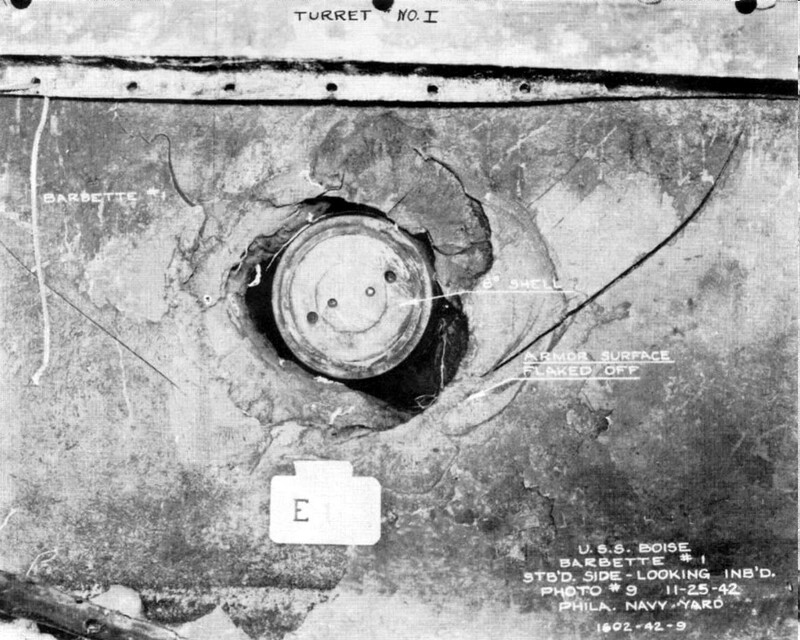 Fragment damage from hit No.6 to bulkhead No. 35, as seen from magazine A-507-M.
View of lower handling room of turret No. 1. This shows open ends of powder hoists with powder cartridges still in hoists. Note that powder burned out of No.1 and No.2 cartridges but not No.3. 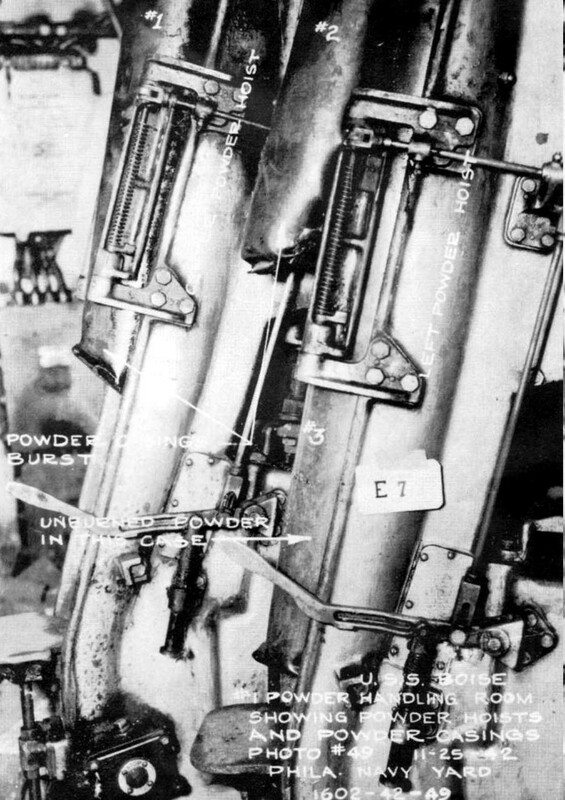 No.2 cartridge was apparently forced down over No.3 by pressure from powder burning above it in the hoist. 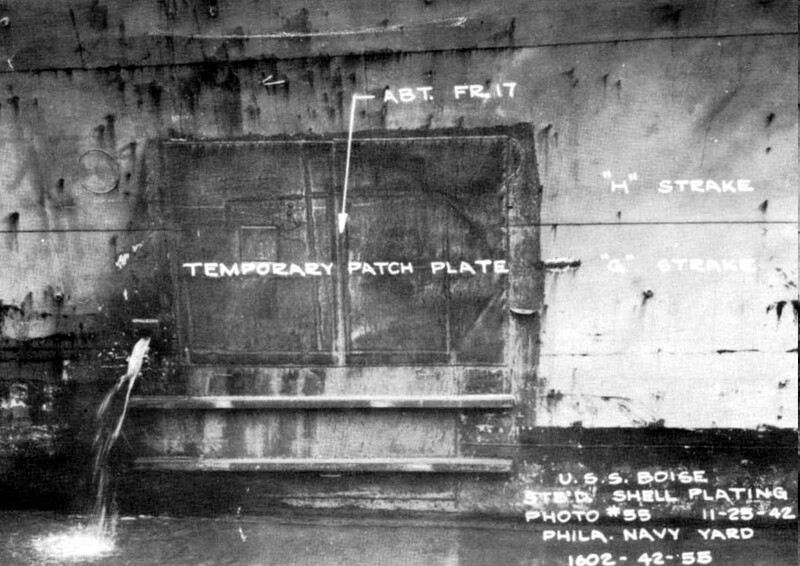 View of temporary patch plate on hull at Frame 17 from hit No. 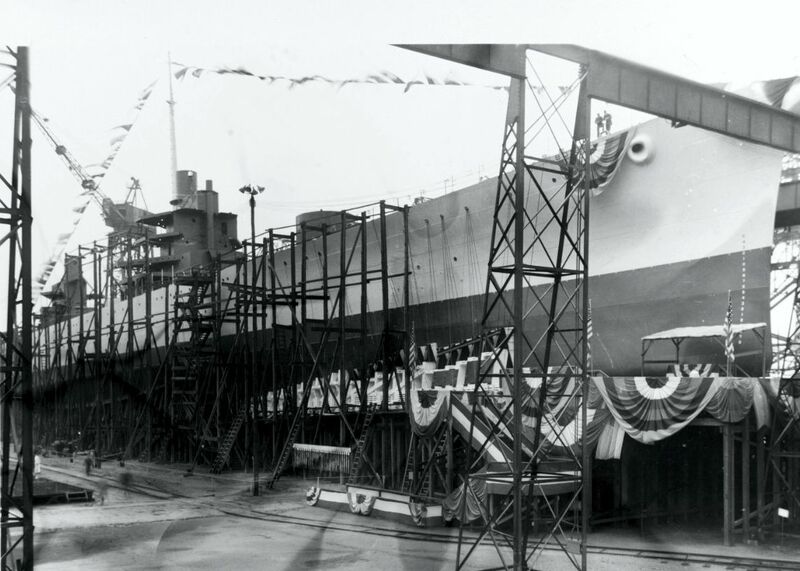 7, as seen after dry docking at the Philadelphia Navy Yard on 25 November 1942. 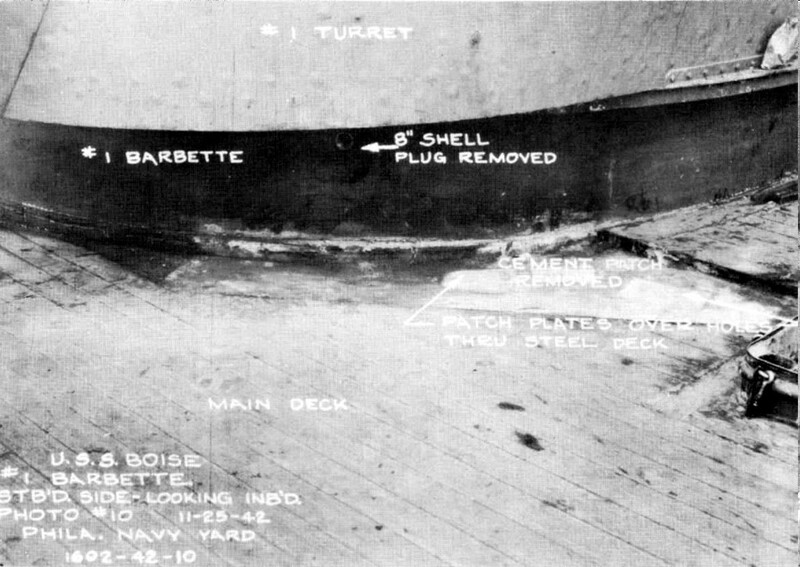 Location and damage to main deck from hit No. 5. at No. 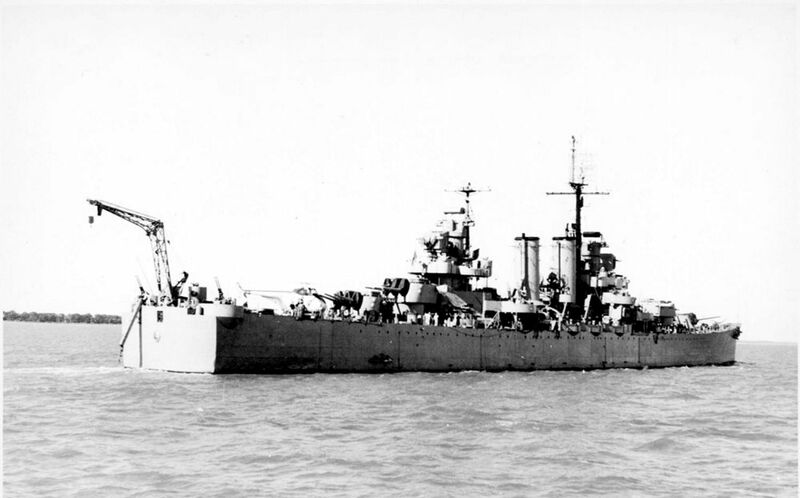 1 turret barbette, as seen on 25 November 1942 at the Philadelphia Navy Yard. 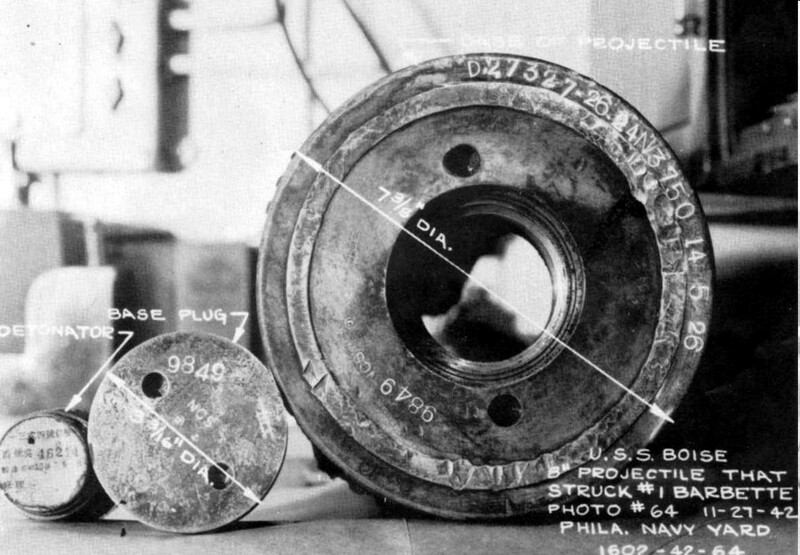 The arrow points to location where the 8-inch shell plug has been previously removed. 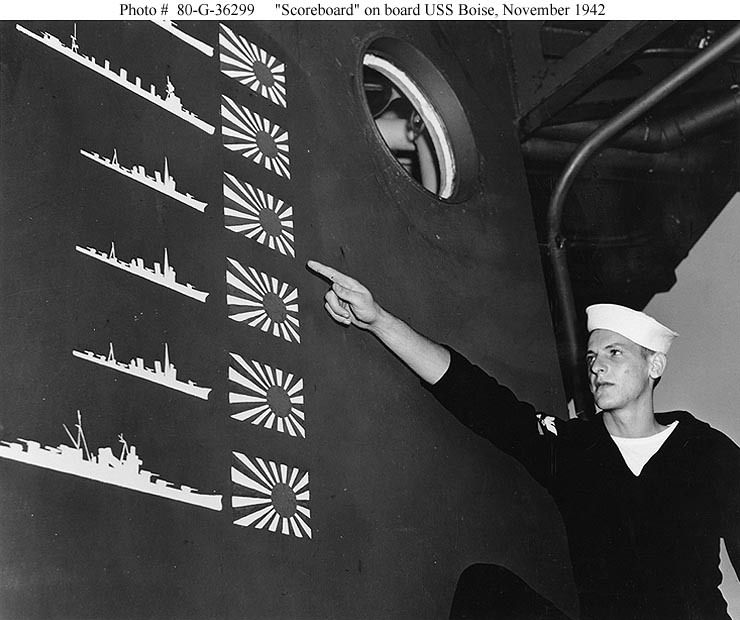 Sailor W.R. Martin points out details of the Japanese trophy flags painted on the cruiser's pilothouse as a scoreboard of enemy ships claimed sunk in the Battle of Cape Esperance, 11-12 October 1942. The six Japanese ships (two heavy cruisers, a light cruiser and three destroyers) represented in this scoreboard greatly overstates the actual enemy losses, which were one heavy cruiser (Furutaka) and one destroyer (Fubuki) sunk and one heavy cruiser (Aoba) badly damaged. This over-claiming was typical of contemporary night surface actions. 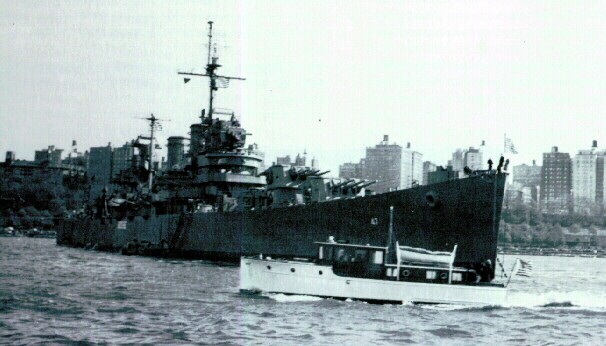 Photographed at the Philadelphia Navy Yard, Pennsylvania, soon after Boise arrived there for battle damage repairs in November 1942. Official U.S. Navy Photograph, now in the collections of the National Archives - 80-G-36299. 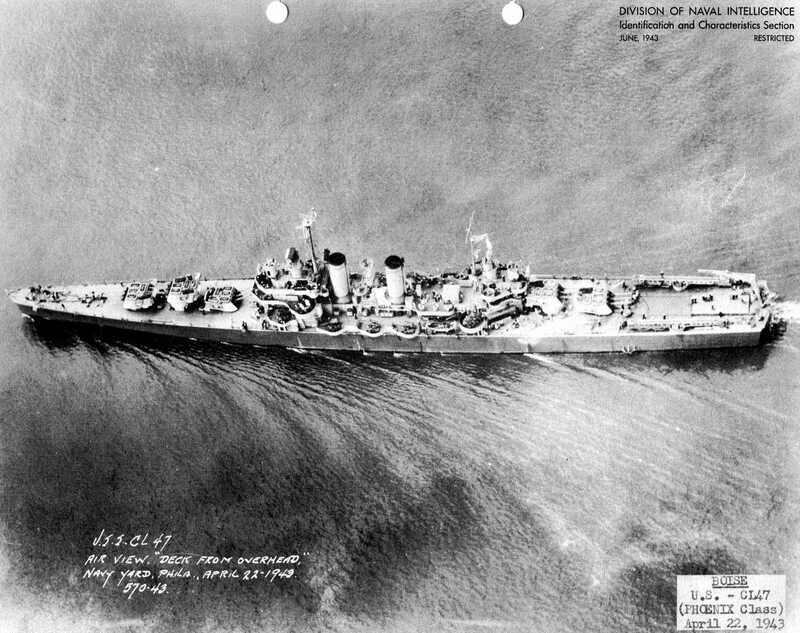 Aerial view taken at the Philadelphia Navy Yard, 22 April 1943. Shelling the coast of New Guinea in early 1944. 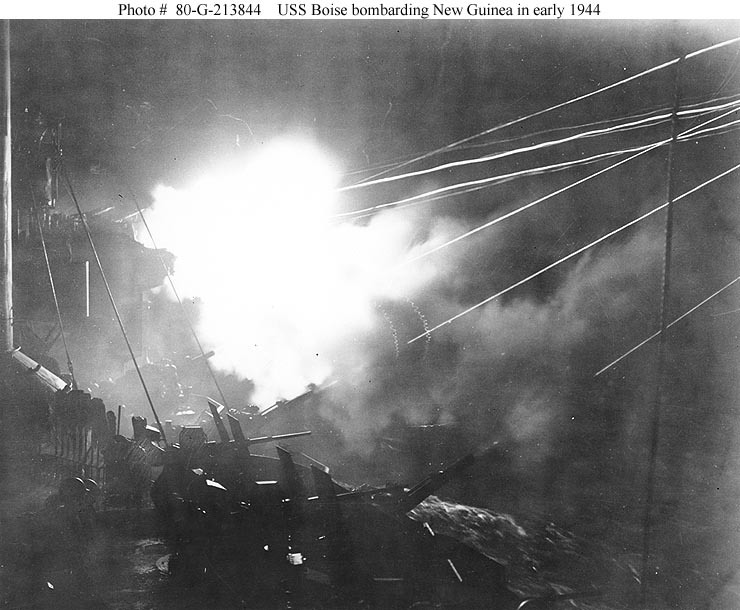 Photo is dated 10 February 1944, but may have been taken during the Madang-Alexishafen bombardment of 25-26 January 1944. This view looks forward on the starboard side from the midships 20mm gun gallery. Note tracers, which appear several feet in front of gun muzzles. 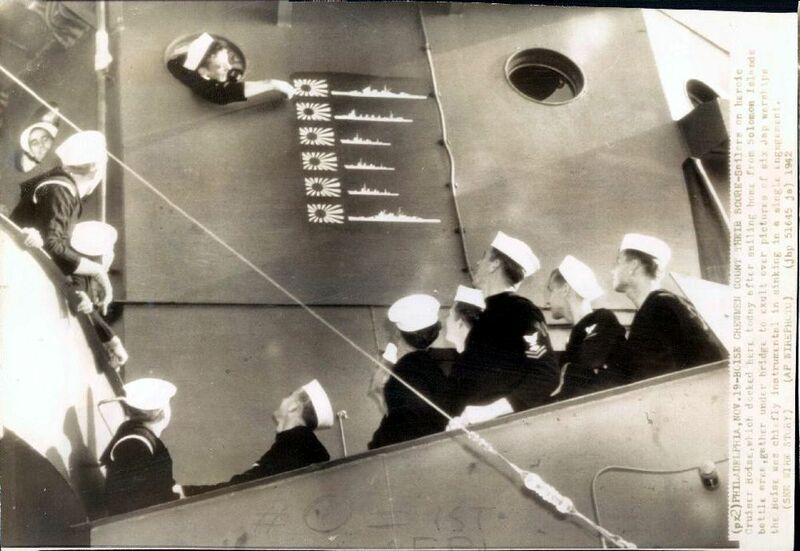 Those from the four starboard side 5"/25 guns have a higher trajectory than the tracers fired from the forward 6"/47 gun turrets. 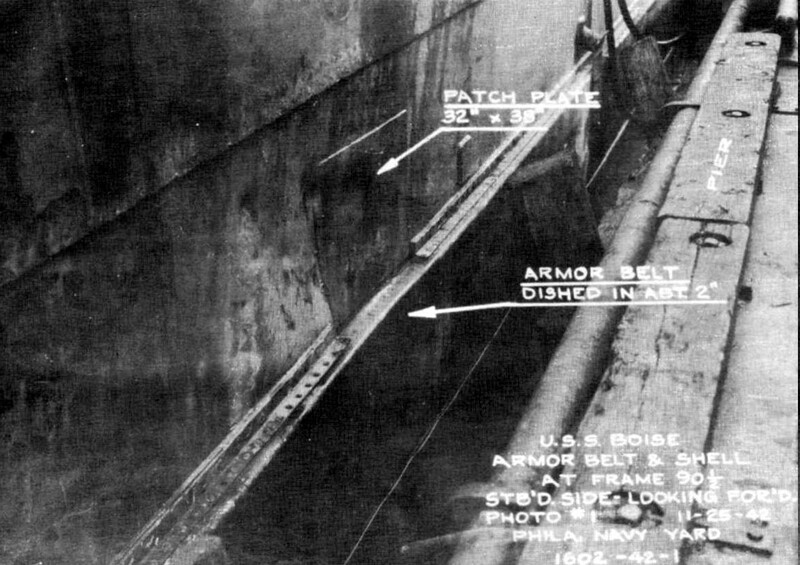 Tracers from the 6-inch guns appear to wobble slightly. 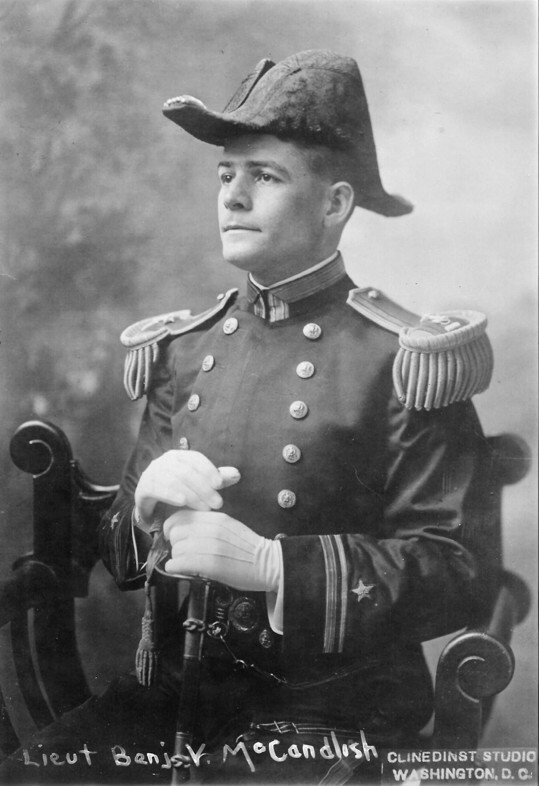 Official U.S. Navy Photograph, now in the collections of the National Archives - 80-G-213844. 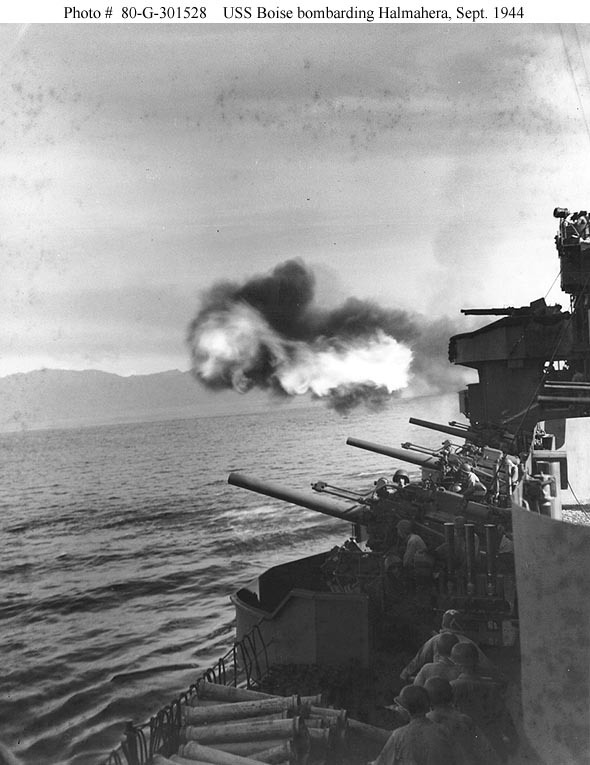 Bombarding the Galela sector of Halmahera Island during the Morotai invasion, 15 September 1944. This view looks forward on the port side from the midships 20mm gun gallery. Guns in the foreground are 5"/25s. This firing is being done by the forward 6"/47 gun turrets. Note ammunition passing party at work in the lower right. Official U.S. Navy Photograph, now in the collections of the National Archives - 80-G-301528. 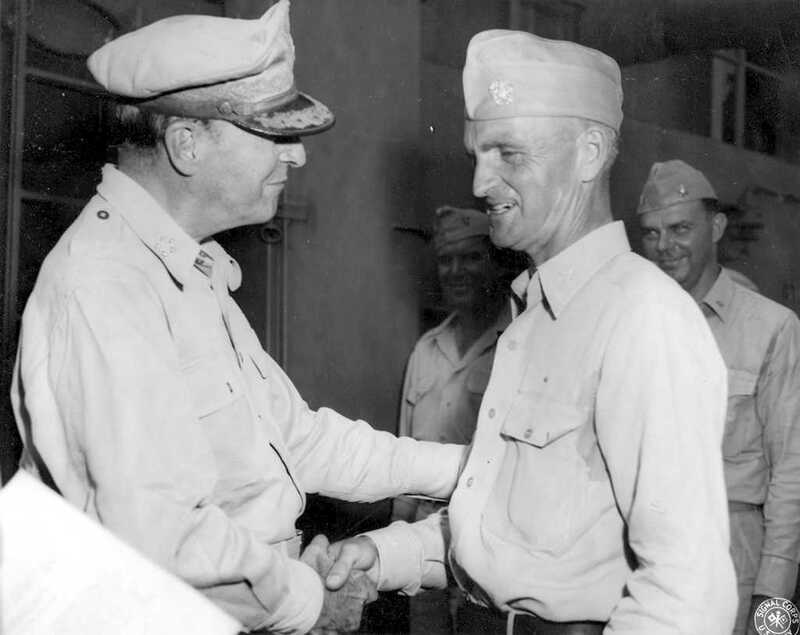 0404720 General Douglas MacArthur congratulates Captain Williard Merrill Downes on receiving his gold star for his second Legion of Merit on the cruiser USS Boise (CL 47) in Brunei Bay in 1945. Photo from the MacArthur Library and Museum. 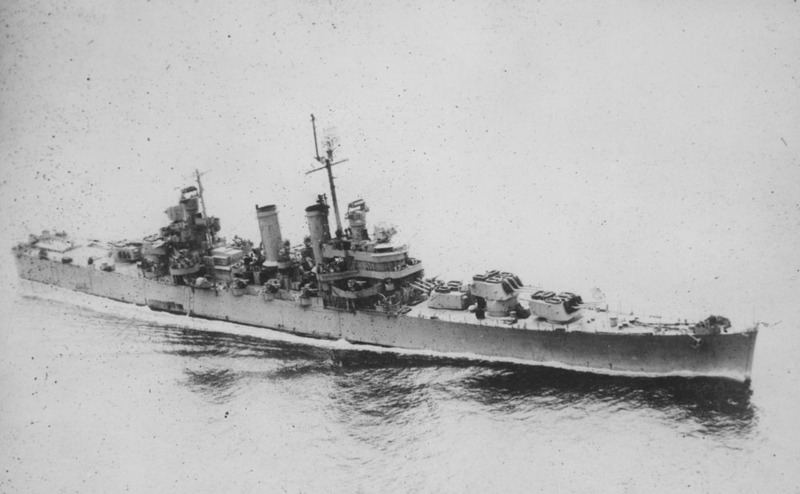 Off San Pedro, California, 14 September 1945, following overhaul. 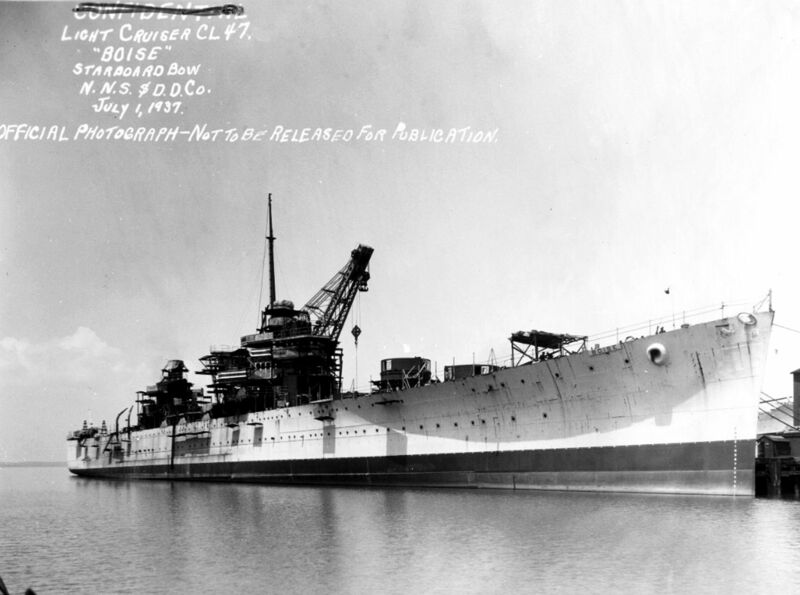 Photograph from the Bureau of Ships Collection in the U.S. National Archives - 19-N-89077. 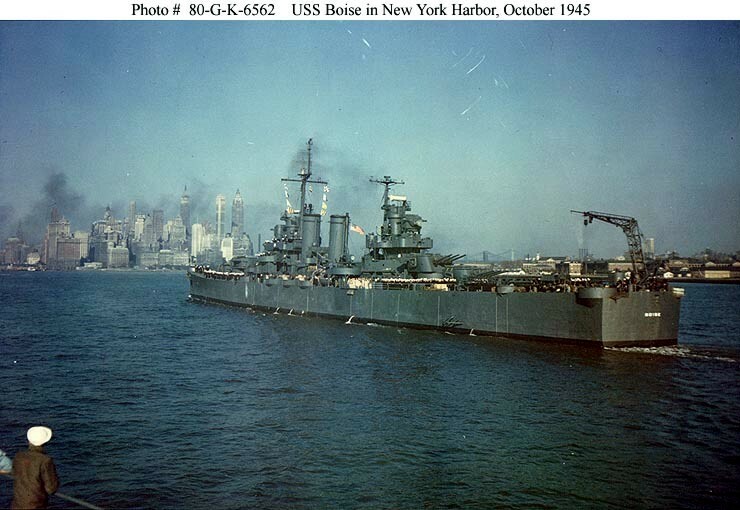 USS Boise Arrives in New York Harbor on 20 October 1945, to participate in the Navy Day Fleet Review. The south end of Manhattan Island is in the background. 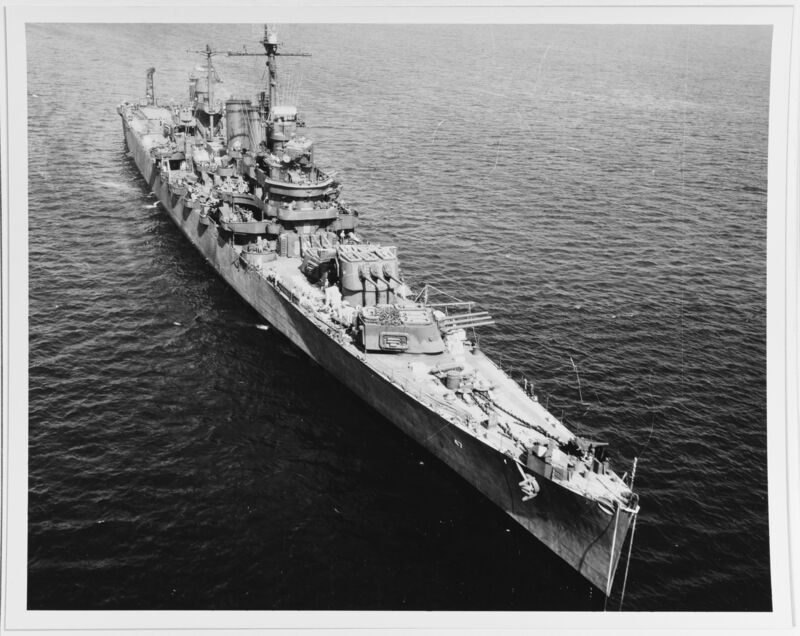 Official U.S. Navy Photograph, now in the collections of the National Archives - 80-G-K-6562. 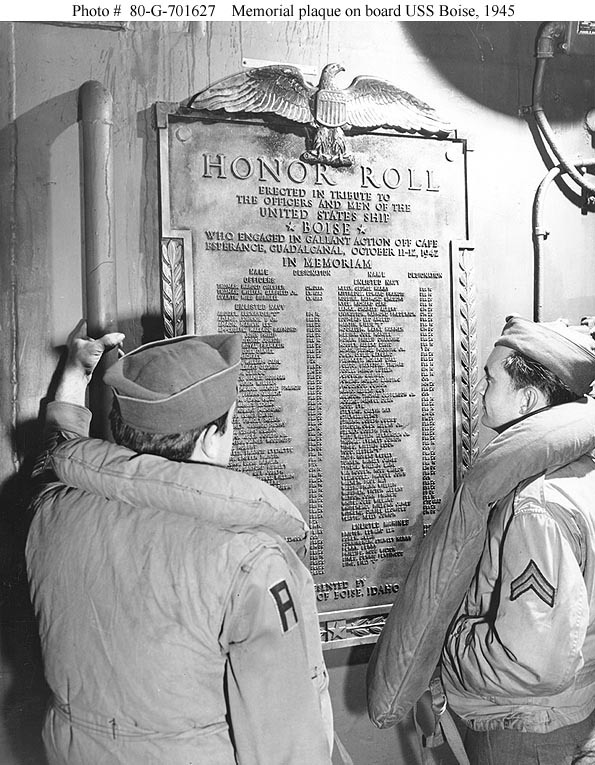 U.S. Army Private First Class Felix A. Uva (left) and Corporal Donald A. Purdy examine a memorial plaque on the cruiser's main deck, while they were being transported to the United States from Europe as part of Operation "Magic Carpet" in November 1945. This plaque was presented to the ship by the citizens of Boise, Idaho, in memory of the 107 crewmembers who lost their lives in the Battle of Cape Esperance, 11-12 October 1942. Note kapok life jackets worn by the Soldiers. 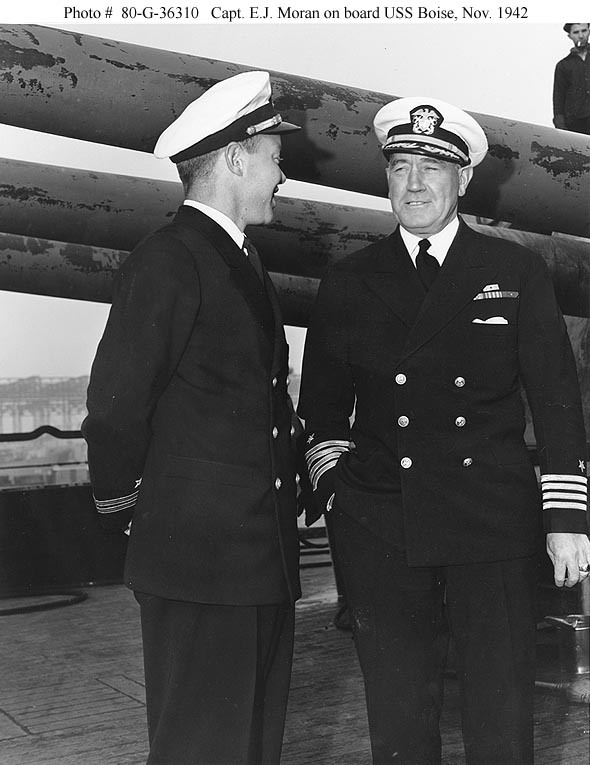 Official U.S. Navy Photograph, now in the collections of the National Archives - 80-G-701627. 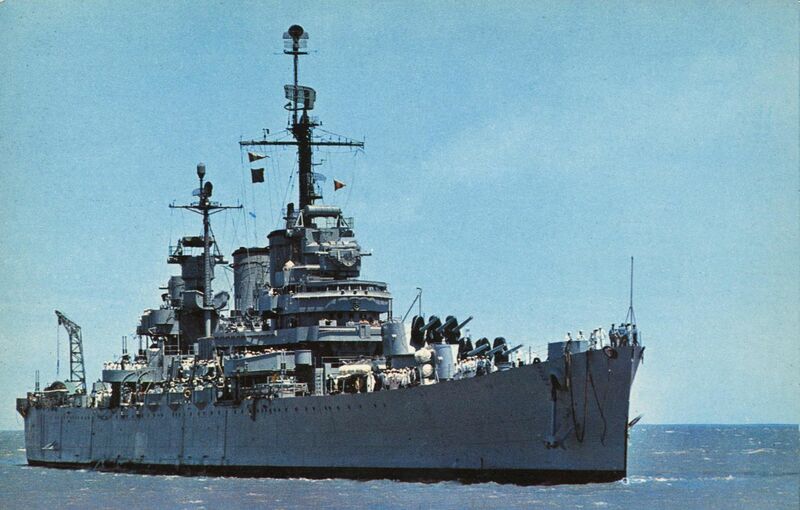 Starboard side view of Nueve De Julio (ex-USS Boise), circa 1964, location unknown. Note the sail boats aft.